Arrived at Basel airport @11:15. Unpacked bike. Met Richard, who’d travelled down from his home in Strasbourg. Fine weather. 70km cycling on fast roads to Masevaux. Got tyres inflated at cycle shop (I’d deflated mine for plane travel, and a hand pump never quite gets full pressure). From Masevaux straight up the valley and on to climb the Ballon d’Alsace, the first mountain ever to feature in the Tour de France back in 1905. We really didn’t know how hard it would be until we tried it. The first mountain stage in the history of the Tour de France also introduced the race’s first climbing specialist, René Pottier. 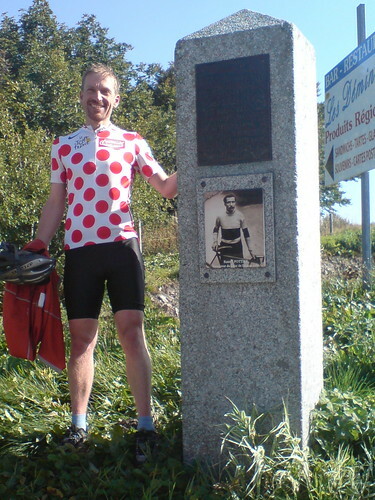 Although the polka-dot jersey of the race’s “King of the Mountains” did not yet exist, Pottier was clearly the 1905 Tour’s mountain man. 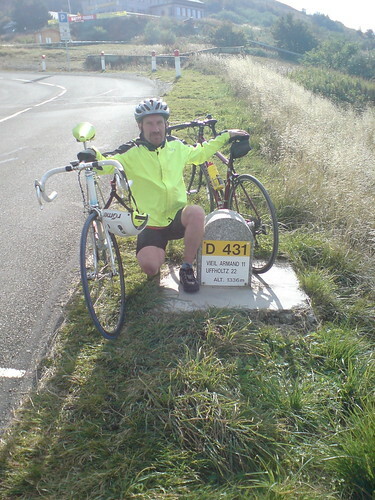 Up the tough Ballon d’Alsace climb Pottier was the only rider who did not walk part of the way. In fact, he climbed the Ballon at an admirable average speed of 20 km/hr, respectable even by today’s standards. We didn’t walk either, but Pottier would indeed have shown us a clean pair of wheels. Inspired, we went on to tackle two more mountain climbs, including the Ballon again by a second approach. The third climb felt much harder. At the end of the day we ate fried carp and chips, the regional speciality. We finished the first plateful. Out came another. Another fabulous day in the mountains, including a 20km stretch along the crest road, about 1100m up, finishing at the peak of the Grand Ballon. Formidable! Top speed: 67km/h. Friday’s route, in reverse, and faster. Visited Basel. 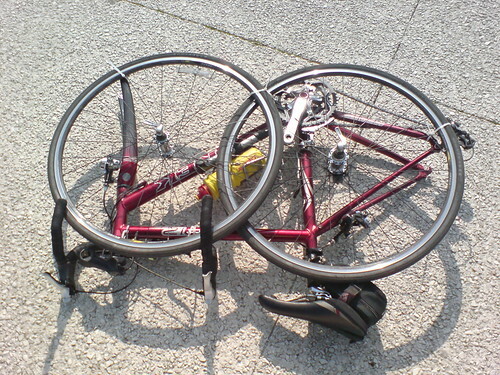 Dismantled bicycle. Flew home.